Newborns don’t really need toys. Because they don’t see colors yet during the first few weeks, what they need are the warmth of your cuddles, the melody of your soft voice, lots of sustenance when needed and your constant loving presence. 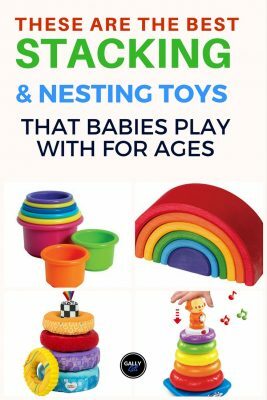 At about 3 months, a few developmental toys may come useful for your newborn. 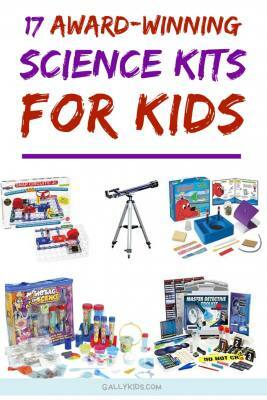 At this time, provide toys that help in developing fine and gross motor skills as well as for sensory stimulation (although not too much or they might not settle easily!). Music is one of the things that a baby loves. The right music calms them, invigorates them and develops their senses. 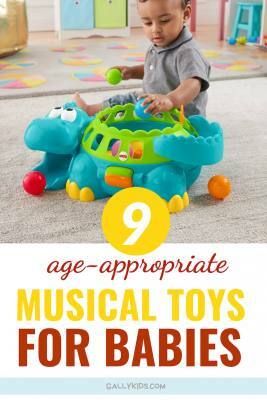 These musical toys for babies under 6 months are not absolutely necessary. Singing or listening to the radio are just as beneficial for young babies. 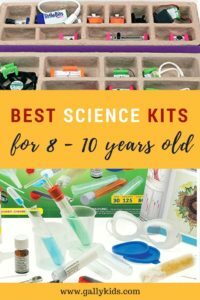 However, sometimes, it’s nice to have 1 or 2 of these educational toys for times when you want your baby to play by himself, when you want something to help him go to sleep, or when you want some kind of entertainment when you’re out and about. There are loads of these baby musical toys (click here for older babies). 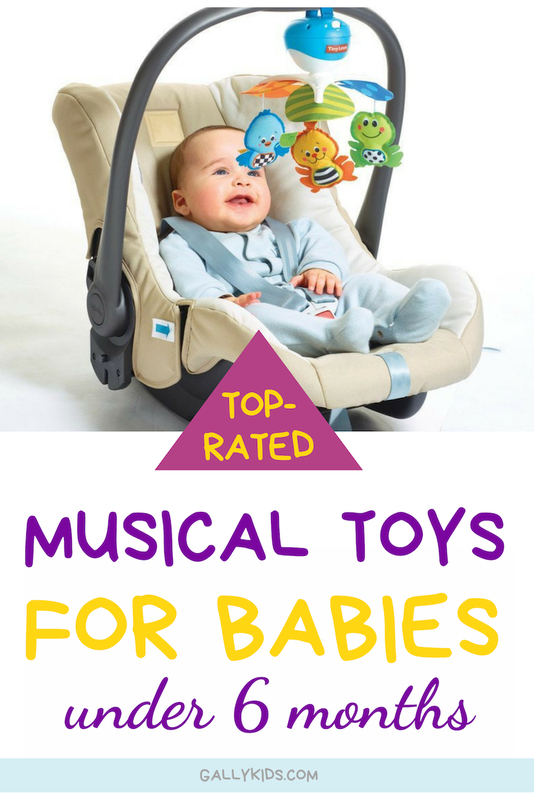 Below are the highly rated toys that babies usually like. 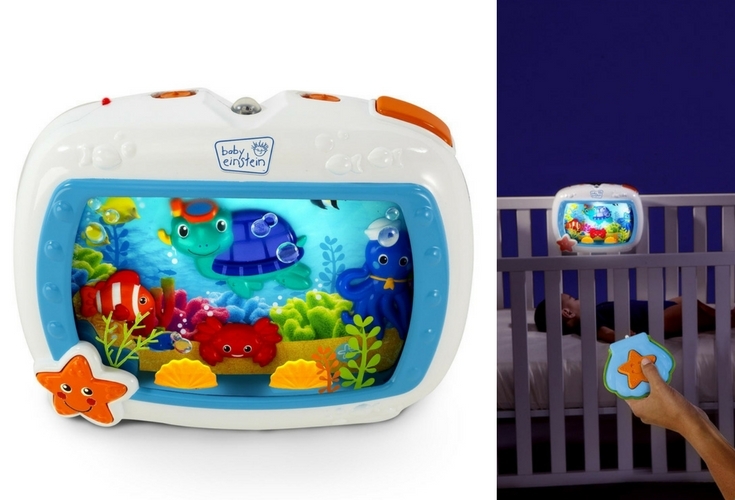 The Baby Einstein Take Along Tunes plays classical music and lights up. Just the perfect toy for a baby under 6 months. This isn’t just a soft cuddly toy. The Vtech Lil’ Critters Moosical beads also entertain babies. So it will start simply as a plushie to cuddle. 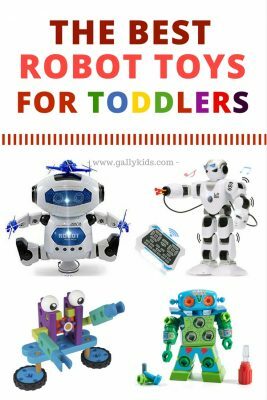 However, as soon as she starts to learn how to grasp or press things, she can press the 3 buttons which light up and do different things. The red button has the ABC song. The yellow button says numbers 1 – 3 and the blue button turns around — a very simple thing but one that helps your baby develop fine motor muscles which she will need later on for tasks like holding cutlery or writing! The problem with a lot of musical toys for babies is that they need batteries which can be a pain — especially when it runs out in the middle of the night and you don’t have a spare one at hand. That’s what makes this Gund plush musical toy different because it’s a wind-up one. And also, can’t you see just how cute this little plush toy is? 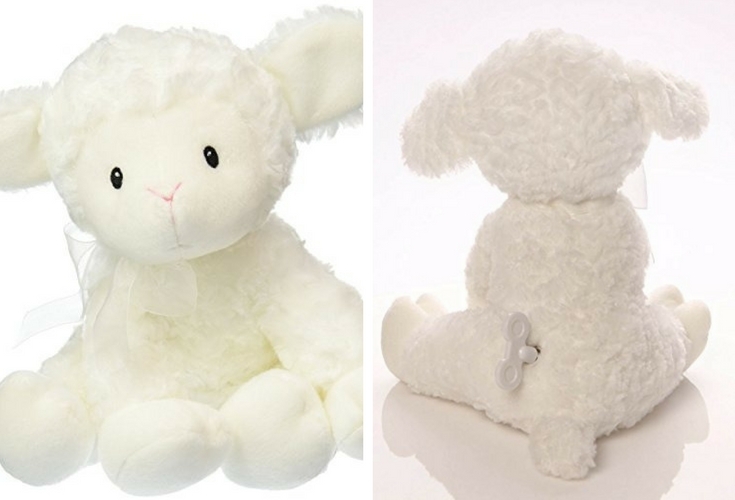 This stuffed toy has two types which play different music. One plays Jesus Loves Me and another one plays Brahms lullaby. 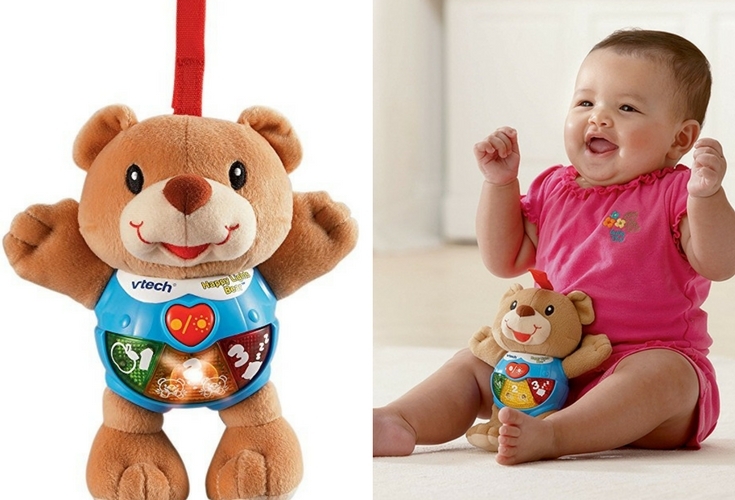 The Vtech Happy Lights Bear works a lot like a cuddly toy than a musical one. Yes. It plays music but this is not the toy’s main attraction. It’s just the right size to take with you on car journeys, stroller walks or attached to a crib. This lights up, sings over 35 different kinds of songs and says some phrases that babies love to hear. 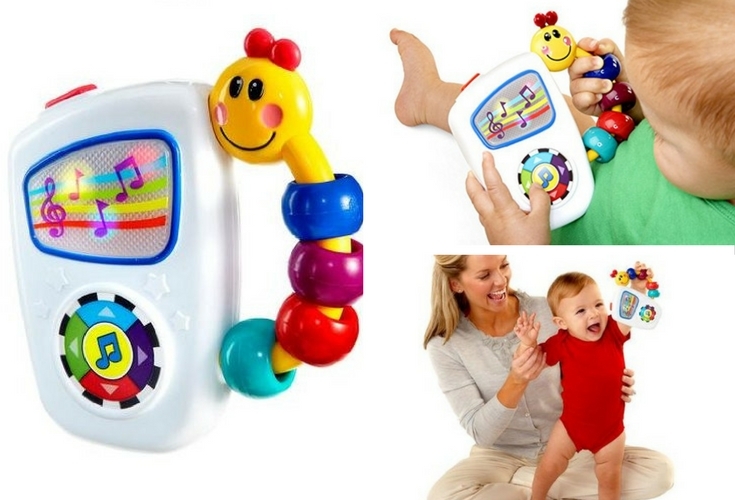 The Baby Einstein Soother is a musical toy for infants is a soother to help babies go to sleep. It plays soothing lullaby music and has lights and sounds to calm a baby down. It also has a lighted panel with sea creatures in it. If you want a crib toy to help your baby go to sleep, have a look at the Baby Einstein Sea Dreams Soother. If you want a portable mobile to take with you for when you’re traveling with your baby, check out the Take Along Meadow mobile. This mobile has 5 songs that play continuously for 30 minutes. 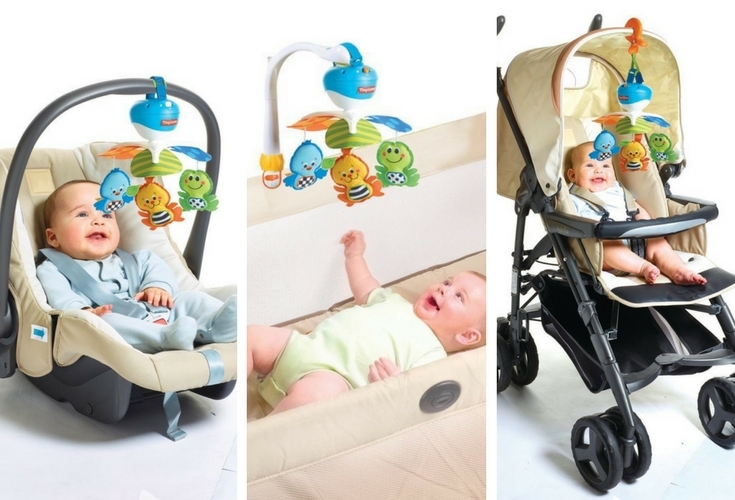 You can easily attach it to strollers, infant carriers, pack and plays, and cots. It’s attached with a clamp that you can easily detach so that you can take it off if you need to use it for when you’re out and about or going on a holiday. Your newborn doesn’t need toys, but if you must buy one, I recommend a good play mat like the Kick and Play Piano gym . My main reason would be it’s a good incentive for tummy time. And tummy time is always useful for developing important muscles to start sitting, crawling, standing and of course walking. There are a lot of well-made mats and play gyms for babies. If you want one that’s also musical though, there’s not a lot of them. 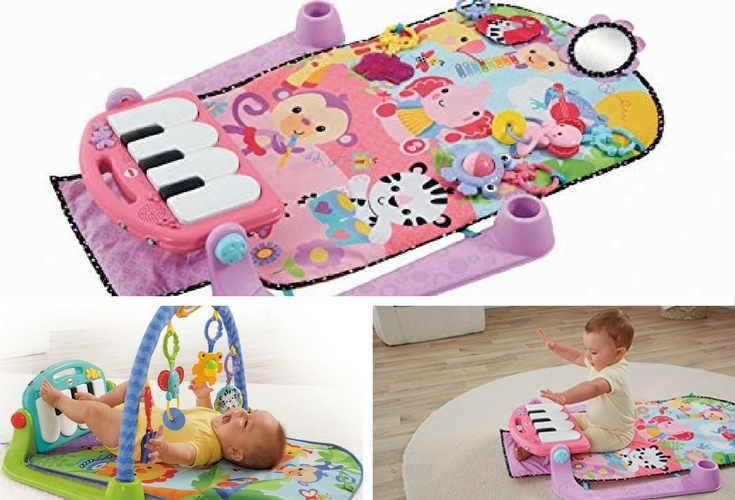 This Kick and play piano gym mat has piano keys which plays music when your baby presses or kicks them. 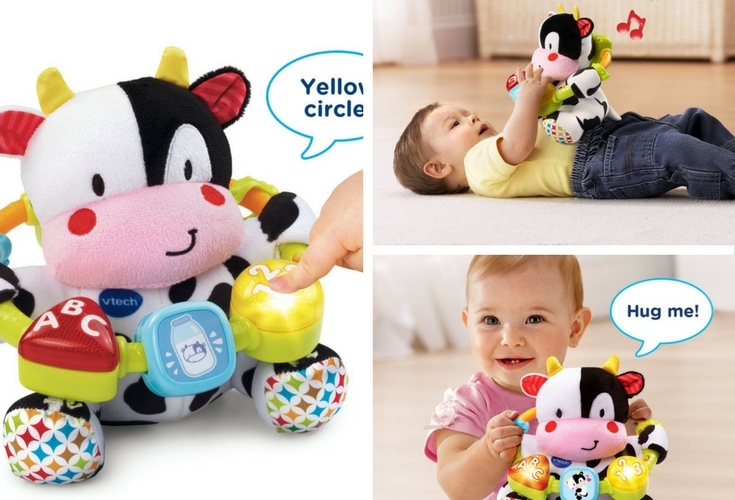 The Hug and tug bug is a musical toy that gets activated when you pull it. It only plays one song for about 90 seconds but it’s enough to entertain a young baby. 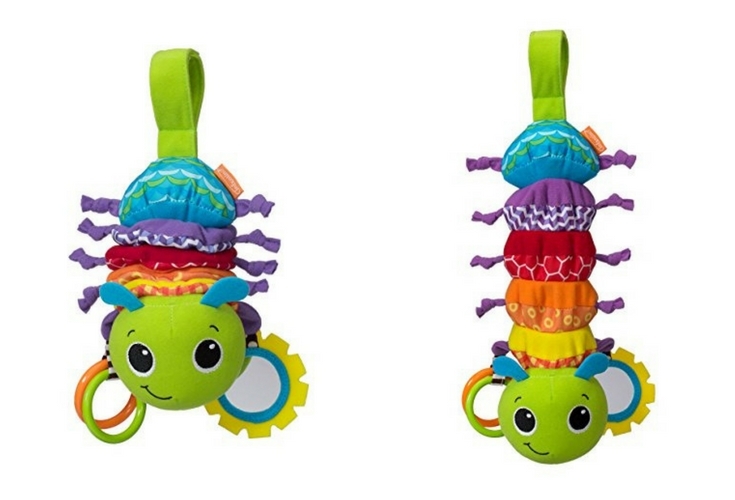 It’s very colorful and has simple activities that babies can do like looking into the unbreakable mirror, pulling the rings or just giving the little caterpillar a nice lovely cuddle. And the best part? It’s small enough that you can attach it to a car seat for long car journeys (it has a velcro for this). Or perhaps attach it to a stroller or crib. If you don’t want a bug, you can buy the giraffe instead. It does exactly the same thing but well, it’s a giraffe! 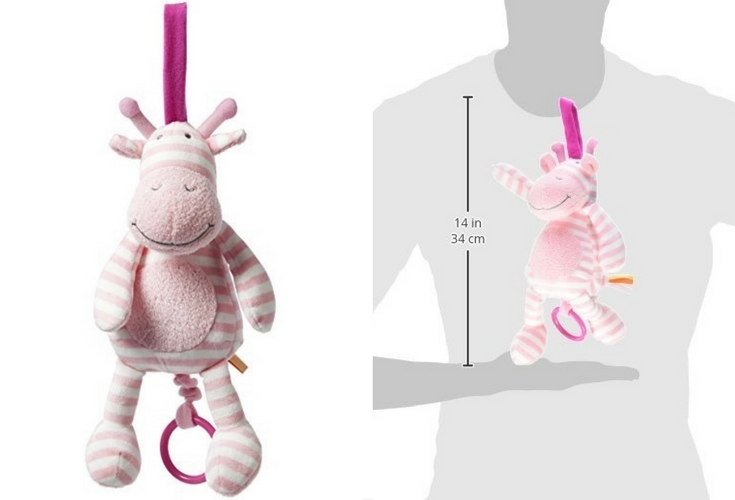 There are many types of these plushy pull toys that play music for babies to listen to. I particularly like this Manhattan Toy pink giraffe which plays classical music. If giraffes do not interest you, there are a few other really cute animals too like the Lullabye Squirrel, Blue and pink hippos and Dr. Seuss Horton. This plays Mozart’s Lullaby for about a minute — not very long but babies really like it. It’s also small enough to be taken with you for days out.